Do you feel that the overuse of pesticides by farmers is a health hazard? The commission considers it safe to record a finding that there is credible evidence against Jagdish Tytler to the effect that very probably he had a hand in organising attacks on Sikhs. The commission points fingers at several “local” Congress leaders, including Sajjan Kumar, MP, late Dharam Dass Shastri and H.K.L. Bhagat. 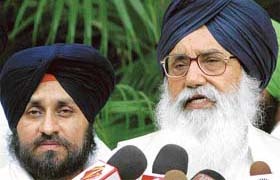 Shiromani Akali Dal President Parkash Singh Badal (R) addresses a press conference in New Delhi on Monday after the Nanavati Commission report was tabled in Parliament. Cloudy skies over its Florida landing site today forced NASA to postpone the return to Earth of space shuttle Discovery, prolonging by at least a day the first shuttle mission since the 2003 Columbia disaster.